Bruce Loomis, a 76-year-old retired school guidance counselor from Ashtabula County, Ohio, graduated with a degree in music education and taught music for three years in Michigan before returning to Ann Arbor for a master's degree in counseling. For the next twenty-five years he served as a guidance counselor at junior-high schools in Ohio. But Loomis, a trumpeter, always retained his love of music, instilled in him at an early age by his mother, who was the music teacher in his hometown. Loomis's late sister was also a music teacher. "Music is an important part of my life," says Loomis, who in addition enjoys gardening and backpacking. He also enjoys evaluating the impact of his philanthropy. "I remember back in college, touring with the University of Michigan Symphonic Band," Loomis relates. "In Flint we saw a billboard that read, ‘Thank you Mr. Mott,' which was in reference to all the great things C. S. Mott and his foundation had done for the city. "I recall thinking at that moment that it is valuable to give charitably while one is still alive, to make sure that the monies are being expended effectively." Three years ago Loomis became determined to find and fund programs that support the personal growth of high-school age students, programs that can provide a pre-college infusion of self-confidence, proficiency, pride, and perspective. He identified some youth-oriented programs and provided support in the form of tuition assistance. Now, says Loomis, he's watching to see which programs deliver the results he hopes for. To that end, after having privately provided the means for two students to attend Interlochen Arts Camp in 2010, Loomis drove nine hours north for a first-hand look at our summer program. At Interlochen, Loomis says, he found "young people who are serious and proud, who want to do a good job, who care about what they are doing. The Campers are encouraged to pay attention to detail, and they clearly have admiration for those who are guiding them." Loomis concedes that before visiting campus, he had been concerned that such a concentration of young talent would engender arrogance or over-competitiveness. Instead, he says, he was impressed with the students' healthy striving, strong friendships, enthusiasm, and willingness to communicate. "Interlochen is an eye-opener for the child who has been a star performer in his or her own small school," Loomis notes. "When there are hundreds of other kids who are just as good or better than you, you can learn from that." At Interlochen Loomis also found "an energy that you don't get with professional adult artists." 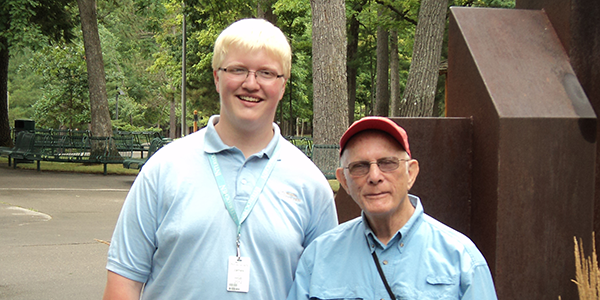 Spending a week at Interlochen Arts Camp 2010, Loomis states, was "one of the most inspiring experiences of my life." A few months after that campus visit, Loomis put plans in motion to establish an endowed scholarship fund at Interlochen, memorializing his mother and sister. Earnings from that fund will provide tuition assistance to needy and talented students wishing to attend Interlochen Arts Camp. By making an endowed gift, Loomis has helped to ensure that the results he seeks to achieve with his philanthropy will stretch far into the future.